Originally designed by Farrand as a sunny herb garden with shady seats beneath the wisteria-covered arbor, the Arbor Terrace is now paved with Crab Orchard stone, and is decorated by potted plants, which are changed seasonally. On its northern and eastern sides, double rows of Kieffer pear trees enclose the terrace. Seen from the gardens below, the trees screen the retaining wall and hide the steep slopes. 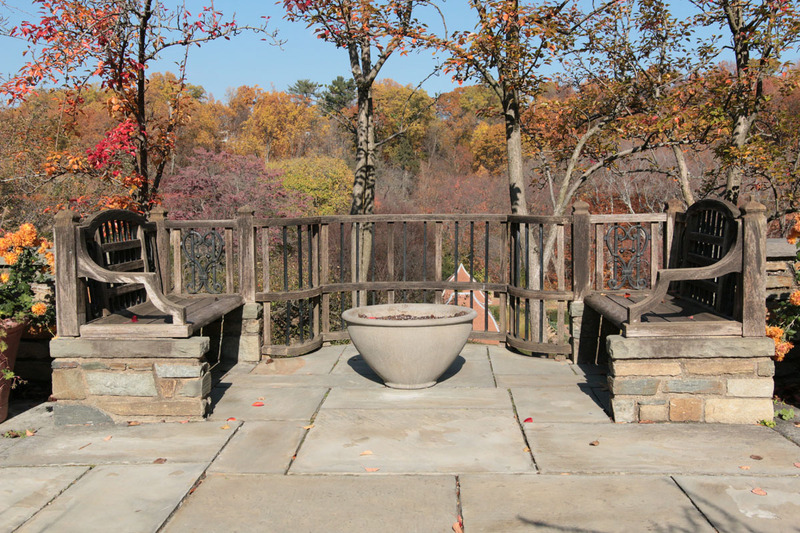 On the western side of the terrace, the cedar arbor minimizes the height of the retaining wall that is also the northeast corner of the Rose Garden. The arbor’s design is based on a sixteenth-century arbor design by French architect Jacques Androuet du Cerceau. Under the shade of the wisteria roof, water pours from the mouth of a lead river god into a pool decorated with lead cattails. On the wall to the south is an inscription from Dante. This plaque in the Wisteria Arbor commemorates the Blisses’ friendship with Gelasio B. A. Caetani, the Italian ambassador to the United States from 1922 to 1925. The Caetani family owned the Codex Caetani, a manuscript of Dante's Purgatorio. The lettering of the inscription is in the same style as the manuscript. Double bench and railing, teak, oak, and iron, Beatrix Farrand, ca. 1938.